I first started when the Oso slide happened. I had a very dear friend of mine that lost his brother in the slide, and just being a person of the community I had to do something to help. The first couple of weeks I was driving my truck back and forth to bring supplies out to people in Darrington who had lost family members or family members who were out in the field looking for the people who were lost. But I was getting frustrated because I wanted to do more. Right around that time I saw on Facebook that they were looking for someone to run and operate the food truck, and I have 20 years of experience in the restaurant industry because I am a stay at home mom, Sunday school teacher, vacation bible school teacher, and I can cook. 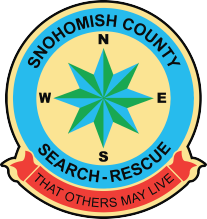 April 1st was my first day with the Search and Rescue Operation Support Unit and the food truck. I spent 21 days out in Oso and I never thought I could be a part of search and rescue because I am just a housewife, I’m just a mom, a grandma – but I loved it so much that I joined. I had been involved for a little over a year when I became treasurer. Having the ability to serve and help the community is a blessing, and I truly love it.